Salt to the Sea is marketed as being set on an overcrowded ship during World War II, and I have to say that that’s a little bit of a white lie. Very little of the book is set on the ship itself, as the first couple of hundred pages follow the various characters as they try to get to the ship to escape war-torn East Prussia. This isn’t necessarily a negative, but since I hadn’t actually heard of the Wilhelm Gustloff before reading this book (more on that in a minute), I wasn’t expecting the characters to be wandering around in the woods so much. One thing I’m not used to with Sepetys’ books is having more than one point of view. There are a lot of POV characters in this book, and I am pleased to say that it all worked really, really well. The book wouldn’t have been the same with just one viewpoint, as each of the characters provided their own unique view and experience in regards to the war and their countries. I loved all of the point of view characters, apart from Alfred. He certainly added to the story, but as a character he… well, he wasn’t one of the good guys. I really struggled with his chapters at times, and I think a lot of readers will as well. That said, he was intriguing, and I enjoyed getting into his head, even if I didn’t understand him and his actions at all. So, Salt to the Sea features the Wilhelm Gustloff, the sinking of which marks the greatest and most fatal sea 13disaster in history. And yet, I had never heard of such a ship. Why? Because people covered it up. Nearly ten thousand people died on the Wilhelm Gustloff alone, and that’s not taking the other sunken ships of the Baltic into account, and no one knew about them. 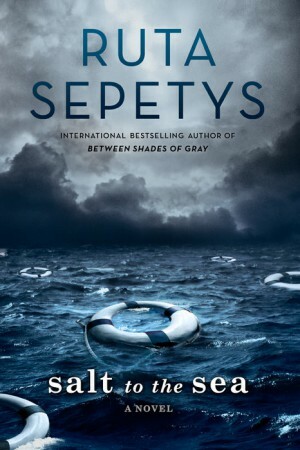 So I have to thank Ruta Sepetys for bringing this sea disaster to my attention. Also, can I just say that that Sepetys’ author’s notes are always awesome? I love how much she cares about the victims of history, and about telling stories that people need to hear. Obviously, I loved Salt to the Sea. I loved the characters. I loved the subject matter. And I loved that there was a mention of Lina from Between Shades of Gray! It was unexpected and wonderful. I encourage everyone to give Sepetys’ books a go because, like I said above, she’s an auto-buy author for me and she might make it onto your list as well. I loved this one, too. It was such a vivid, heartbreaking story. The ship part was only a small part of the story, but it definitely left me wondering why I’d never heard of the Wilhelm Gustloff. I’m glad Sepetys is bringing the tragedy to the awareness of so many readers. Glad you love Sepetys as well. She’s become one of my auto-buy authors as well. It will be interesting to see what she does next.